Cast: Jang Hyuk, Lee Ha Na, Baek Sung Hyun, Yesung, Son Eun Seo and Kim Jae Wook. 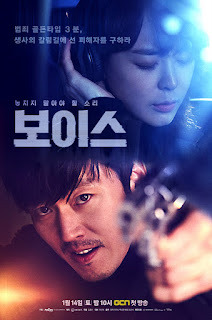 Moo Jin Hyuk (Jang Hyuk) is a detective with a horrible temper. He works at the crime unit, and is known as the “mad dog” because of his ability to track and see through a case. But that changes when his wife is found brutally murdered in an ally. Out of grief and anger, he refuses to go home untill he finds the murderer. The team manages to find a suspect, but because of an operator called Kang Kwon Joo (Lee Ha Na), who says that the killer is the same person who killed her father, the case is dismissed and the suspect flees the country. Firstly, the drama is much more exciting than my summary, so if you went “ah that’s boring”, it is not! This drama made me anxious, excited and thrilled for next weekend, so I could watch the next episode. This os an OCN drama, but compared to many other dramas, this one is so ‘real’ (with the blood and grotesque nature of people). Of course, a bit lacking here and there, but the TABOO about “being too violent”. The acting was okay, though I am not a fan of Jang Hyuk’s acting. And the female actress was likewise, not great – just about average. The storyline and screenplay are both well-executed, so it isn’t as important about them, but occasionally is annoys you. As a general the drama is great. Most recommendable. Actually this drama didn’t work out for me, it was very hard to finish it. Even though I’m a big fan of thriller and crime dramas, this one was just not my cup of tea. Maybe because I felt like Jang Hyuk’s character was really annoying. I get his back story and everything, but still I find him very hard to understand. When working with the police force, there are rules to follow. He Just did whatever he liked. The concept with her hearing the smallest sound, and with that figuring it out was not very well worked out. It dragged out in places where it should be suspenseful, but instead it became boring. What I did like, was the villain. Everything about him was pure crazy, it kinda grew on me. So the last episodes where he had more screentime where the best ones. Anyway, all in all, a failure for me.